Indian Key near Islamorada is not much of a beach to be honest, but it is certainly one that is worth mentioning due to many factors. Firstly, it is on a hugely historic Florida Keys site, which really for anyone with an interest in the place, and fancy getting into the real heart of the islands is a must visit. Secondly, it is great fun, although a little bit energetic getting to Indian Key as the Key is a deserted island that can only be reached by boat or charter. Or even better Kayak, or canoe. So let’s slip your oars into the waters, and set off…….first stop….ok there isn’t any other stops to make than this one….Indian Key. So Where Is The Beach Then? The island is in Islamorada, which is the second of the five main groups of islands in the Florida Keys. If you leave the mainland you will first come to Key Largo, and then shortly afterwards arrive in Islamorada. From the mainland of Florida for example, Miami International airport to Indian Key should only take you about an hour and 40 minutes drive. And believe me, if you do head straight down to Key West, like so many people do (they seem to have desire to get as far south as possible as quickly as possible) then you will be missing out on so much. For more in-depth details as to where to stop throughout the Florida Keys then take a look at our great driving trip guide through the Keys. So head down the Overseas Highway until you reach Mile Markers 77 and 79, and then you will be in the right place to start making your way across to the Key. If you have your own Kayak, then you can look for the park that’s on Oceanside between the two markers mentioned above, and then paddle over. If you aren’t luck enough to have your own water going vessels then don’t worry, we can help you out on this too. How Can I Get To Indian Key Then? As we said head down the Overseas Highway and if you fancy hiring a charter or boat to take you out to the island then you need to go over to Indian Fill Key, which is to be found at Mile Marker 78. These guys run trips out to either Indian Key, or the other historic site at Lignumvitae Key, which you can read about more at the official Florida Keys State Parks site here. The boat trips take around 3 hours, and for people unwilling to power their way across the waters, due to age, or fitness concerns this is a good choice to make. At the time of writing the boats depart at 8:30am, so it is quite an early start, but should only cost around about $6 per person. If you are interested in the trip going over to Lignumvitae Key then you can get a lay in, as they depart early in the afternoon around 13:30pm. Both need to have a reservation made to ensure that safety issues are not caused by overcrowding by phoning (305-664-4815). You Mentioned I Can Hire A Kayak To Get To Indian Key? If you have read anything on this site, you will probably have discovered that there is a highlighted place on Islamorada called Robbie’s Marina. Robbie’s Marina, for non-boaty types have a great attraction for all the family and that it buying a bucket of food and feeding the mighty Tarpon fish. 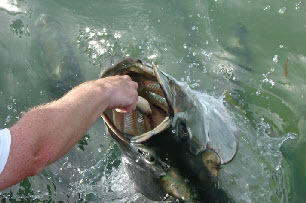 These are huge silver fish that literally fly out the water with their huge mouths gaping to grab the food. It is definitely something to do, if a little scary as they leap up. But getting back to Indian Key, Robbie’s Marina will always hire out Kayaks at around $60 for the day. The paddle across will take between 30 and 40 minutes, and is generally quite calm shallow waters over sea grass flats. The area is a hive of wildlife activity, and after paddling across all the tarpons at Robbie’s, there is a good chance that you may even see shark, dolphin, and even a manatee or two. Which is amazing to see up so close. For more on Robbie’s Marina then click here. When you get to Indian Key, you will find that due to it once being a coral reef, the shoreline is made up of really quite sharp and difficult rocks. Which means you do no need to take care when coming ashore on your Kayak or boat. The dock that is there, is too high for anyone paddling into use, which seems a bit strange, however if you go around to the side of the island that points towards the highway you will find the rocks are lower. This is where I would recommend dragging your boat up onto the shore. What Is The Beach Like At Indian Key? It’s not a huge Bahia Honda type sandy expanse, so don’t think that you will be lazing out on sunbeds or towels. If you do want to go to a typical beach then I would suggest staying at Annies on the mainland, which is a lot easier to get to, and provides most things that you would want in a beach. However, if you want to feel like you are Robinson Crusoe and explore history and country trails, then you will enjoy the whole experience. So What About The History And Stuff At Indian Key? When you get over to the Island you will find a ghost town of ruins overgrown with island vegetation, streets signs showing the direction of the original streets and many crumbling buildings. But does that sound like something exploring? Well yes, as the whole place is linked to piracy, wrecking, and even treasure, which means it has quite a tale to tell if you are willing to spend a little bit of time, reading the signs that are all over the place. But if you don’t have the time, or just fancy looking like the most knowledgeable person on the island, read on, and we will summarize its history. If we start right at the beginning the first recorded settlers didn’t really plan to stay on Indian Key, but instead had to due to unfortunately being hit by a hurricane in 1733. The survivors of the Spanish treasure fleet, struggled in terror as 19 of their ships were destroyed by the huge storm and sought refuge on the island before being rescued. But these poor individuals and a series of Cubans and Bahamians who used the island as a base, never truly settled on Indian Key. It wasn’t actually until 1821, when the previous owners of Florida, namely Spain gave ownership of the state and its Keys back to the United States that movement was made to officially settle down on the Key. In 1824, a man called Silas Fletcher was sent to Indian Key, by two Key West men that he worked for to open up a store on Indian Key. It was thought as a good business opportunity to provide a service to the wreckers, settlers and native Indians that would visit the island. Little by little the settlement increased in size until in 1829, it was recorded that along with the men folk, there were now up a dozen women calling Indian key home too. In 1930, one local businessman moved onto the island and started buying much of the land, which he used to gain control of the community and head decisions in how the land should be run. Although the Indians had never been a problem, in 1840, one early morning a few crept onto Indian Key and attacked the residents killing thirteen, and forcing the rest to escape for fear of their lives. And although it limped on through the Second Seminole War and the Civil War, the island never really recovered its community and now just leave the memories of history for the rest of us to gaze at. It’s in all sense and purposes a ghost time for interested tourists, but makes a great day out for all the family.